This post is sponsored by Nocciolata. All opinions are mine. Now that we’ve gotten our holiday drinks out of the way, I decided it was time for some holiday treats. I needed something enjoyable to go along side my Coconut Hot Chocolate and Peppermint White Hot Chocolate. 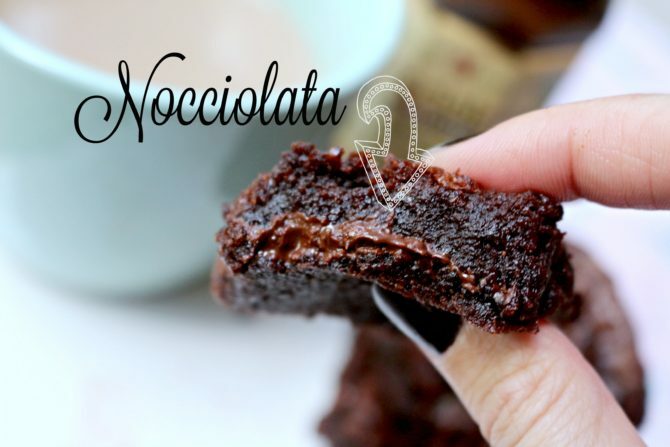 Therefore, I decided to make a fun, gooey brownies made with the one and only Nocciolata. 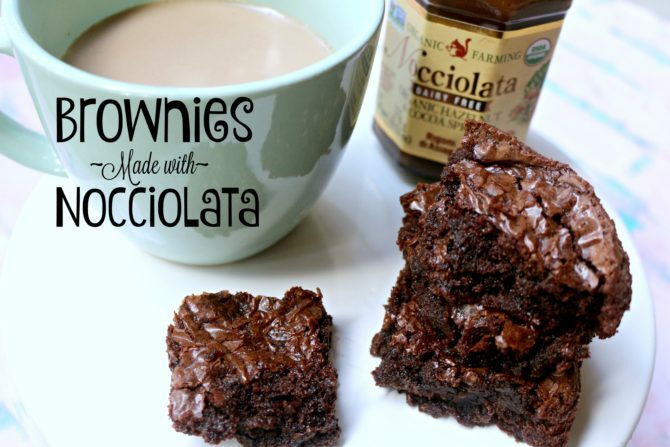 The great thing about these brownies is the fact that Nocciolata is dairy free. Having a child of my own, that has many allergies I love having a dessert option for him. Although these brownies are not something that he can eat, there are always ways to tweak a recipe to make it happen. 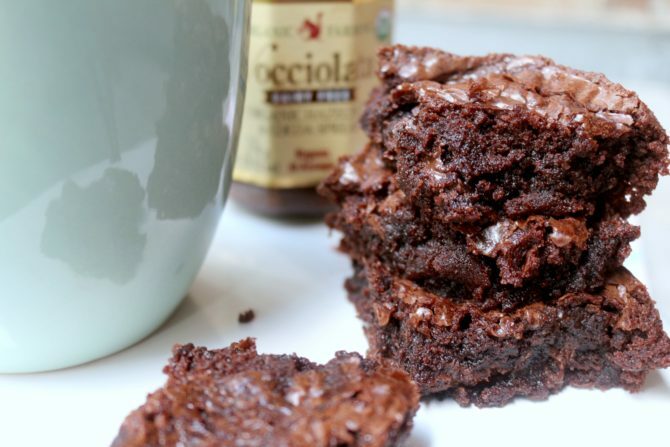 Pairing brownies with a nice cup of coffee or better yet, one of my crock pot recipes, you can’t go wrong. Let’s not forget about the flavor that Nocciolata brings to the brownies. I’m not sure about you, but I am more than excited to have family over during this time of the year. Making delicious food and sharing these moments with loved is something I look forward to every year. Fun Facts about Nocciolata: Nocciolata is made with organic ingredients completely free of GMO’s, preservatives, colors, additives, or artificial sweeteners. It is also made with fair-trade chocolate and environmentally-responsible cold-pressed sunflower oil. Perfect for those with dairy allergies or lactose intolorant. Perfect for those on a Vegan diet. It’s now time to start that fire, invite some family over and watch a movie. If you’re not sure where you can find Nocciolata not to worry. I have a store locator right HERE. Give it a try. It’s mouth watering Hazelnut flavor will bring joy to your taste buds and those you share it with. Mix in all ingredients (except Nocciolata) until soft. Pour half of mix into pan. Using a spoon, spoon out your Nocciolata one spoon full at a time and drop it ontop of brownie mix. Using a fork or nife. Carefully spread your Nocciolata around like the picture below. Pour the rest of mix ontop of Nocciolata and place in oven until cooked through. Time will very depending on the size of the pan. 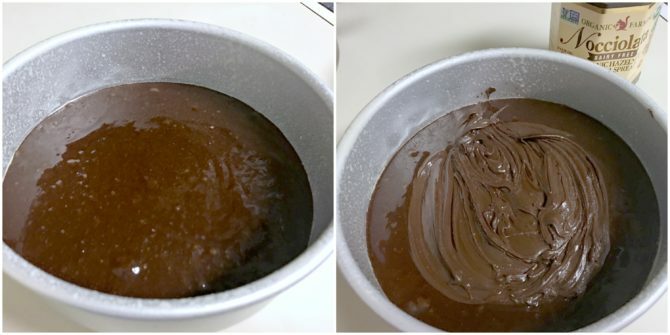 This batter looks like it has chocolate mixed in….is there a missing ingredient? Yes, I don’t know how I forgot the unsweetened cocoa powder ? I’m so sorry about that. It’s 2/3 cup of cocoa powder.